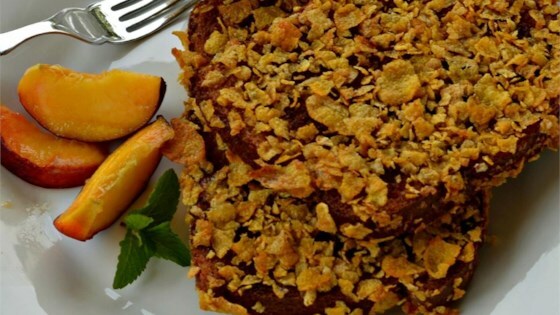 "This is a great alternative to regular French toast. My husband and kids love it!" Beat eggs, milk, sugar, vanilla extract, and cinnamon in a bowl; dip toast into egg mixture and press into crushed corn flakes until coated. Arrange coated toast in a single layer in a baking dish. Bake in the preheated oven until lightly browned and crispy, 6 to 8 minutes per side. I used the recipe as is..It was delicious. I did ,However, cook it on my cuisinart grill..will try the oven next time, but this is a winner. I did not care for this recipe. Mabe if you add pinch of salt it's better. Great recipe. Served topped with fresh berries and bananas.